In recent years, a series of improvements in cycling infrastructure across Aberdeen and Aberdeenshire council areas has seen the bike modal share increase. Aberdeen is Scotland’s third most populous city behind Edinburgh and Glasgow. The city has a high level of employment and skilled workers with its connection to the oil and gas industry and its two universities. It has been identified as an area that will continue to grow during this era of recession in Europe. As part of its plan to improve public and sustainable transport in the area, Nestrans, the Regional Transport Partnership, have undertaken a programme of cycling improvements to help increase the modal share of cycling within a city that is compact and ideal for cycling. - The West Cults bridge, a new bridge on the Deeside Way (£170,000). Most of these infrastructural improvements have included improved signage, improved surface quality and construction of bridges to ensure that routes remain continuous and provide safe and quick journeys for the users. - Sustainable Travel Grant Scheme, which can provide up to 50% match-funding to organisations investing in measures to promote more sustainable travel by their employees or customers. These grants have resulted in the provision of shower facilities, cycle maps and cycle storage at NHS Grampian sites, schools and Universities, Rail Stations, private businesses and Aberdeen Airport. - Getabout is a partnership developed to promote active, healthy and sustainable transport choices. Cycle-related events held by the Getabout partnership have included launches for the new infrastructure listed above, cycle maps in Peterhead and Westhill. 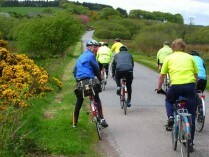 Get Cycling roadshows where people can try all types of fun bikes free have been held across the region. There have been commuter challenges, guided rides, Dr Bike surgeries, sponsorship of Bike Week films, European Mobility Weeks and In Town Without My Car. Overall, this packages of cycling measures have acheived a significant increase in the numbers of people now cycling in the North East of Scotland. Recent results from the Scottish Household Survey (2010) show the proportion of journeys to work by bike was up to 2.7% for the entire north east and 3.5% within Aberdeen City making it the third highest in Scotland. The Getabout website averages 3,500 hits per year with 10,000 page views and recognition of the brand is increasing, which is having positive effects on the promotional work the partnership carries out.